Many have gone to work at Tesla inspired by CEO Elon Musk and his mission. What some found, they said, was a chaotic factory floor where speed trumped safety. An investigation of Tesla’s workplace injuries by Reveal from The Center for Investigative Reporting and PRX has received an impact award from the Third Coast International Audio Festival. It was produced by Will Evans and Alyssa Jeong Perry and edited by Taki Telonidis and Ziva Branstetter. The investigation examined the safety problems surrounding the production of Tesla’s electric vehicles, in a factory employing some 10,000 workers. Since Tesla’s founding 15 years ago, the company’s all-electric cars have achieved cult status among enthusiasts. The rollout of the Model 3 has been bumpy, as manufacturing problems delayed production and frustrated customers. Reveal and KQED found that delays weren’t the only problem. The investigation uncovered serious safety concerns and risks to employees on the factory floor. The investigation also uncovered numerous employee injuries that should have been reported by law but were not. After Reveal and KQED began asking questions about Tesla’s undercounting of injuries, the company belatedly added 13 injuries to its 2017 injury logs. Three days after the story began airing, California’s workplace safety agency, known as Cal/OSHA, opened an investigation of Tesla. Musk also lashed out at journalists from Reveal and elsewhere. 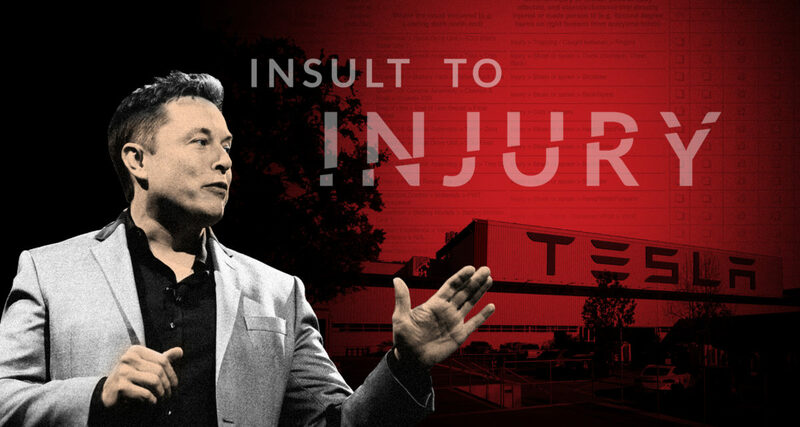 Meanwhile, Congressman Mark DeSaulnier, D-California, called for an intensive “full facility audit” of Tesla and urged state lawmakers to strengthen laws governing the recording of worker injuries. Tesla’s response to the story – calling Reveal “an extremist organization working directly with union supporters to create a calculated disinformation campaign against Tesla” – prompted responses from other news outlets.